Bihar is crucial for the opposition to defeat the BJP in 2019 Lok Sabha elections. In truth it was a brazenly opportunist decision made with the calculation that the opposition had no prospect of dethroning Modi in 2019. “Nobody can defeat Modi in 2019,” Nitish Kumar had declared after switching sides. Yet the mahagatbandhan in Uttar Pradesh has rearranged the matrix. PM Modi’s popularity has come down a few notches since his peak after the Uttar Pradesh assembly election in 2017. True to form, weathervane Nitish Kumar has started making noises against the BJP. He may soon be willing to return to the mahagatbandhan with the RJD and the Congress. Will they accept him? How do you again do business with a man who is willing to dump you at the drop of a hat? The Congress doesn’t have a choice, but will the RJD do so after the humiliation of Lalu and Tejashwi Yadav? How does anyone trust a man like Nitish Kumar? It is not trust but self-interest that is most important in politics. The BJP and Shiv Sena don’t trust each other but are still in an alliance. H.D. Kumaraswamy could go over to the BJP but the Congress is supporting him in Karnataka. Self-interest trumps distrust. In its own self-interest, the RJD should be willing to use Nitish Kumar so long as it needs him. And it does need him, no matter how much Tejashwi Yadav’s stature has risen as a young new leader. The ‘resurgence’ of the Lalu Yadav-led Rashtriya Janata Dal (RJD) in Bihar is being overestimated. A bypoll victory or two in Muslim-dominated areas is no indicator of the larger reality of the state. The larger reality is that the National Democratic Alliance (NDA), with the BJP and the JD(U) as its main constituents, has an upper hand in the caste arithmetic, and we’re not even counting Brand Modi yet. The RJD along with the Congress commands the loyalty of Muslim and Yadav voters, who together form 30 per cent of the electorate. The RJD is working very hard to woo others, especially Mahadalits, but even with these efforts, the RJD-Congress cannot exceed 40 per cent vote-share, leaving the remaining 60 per cent to the NDA. The RJD won four of the 40 Lok Sabha seats in 2014. The Congress won another two. The tally of six could at best go up to 10, given that it will be a bi-polar contest, unlike the three-cornered contest of 2014. 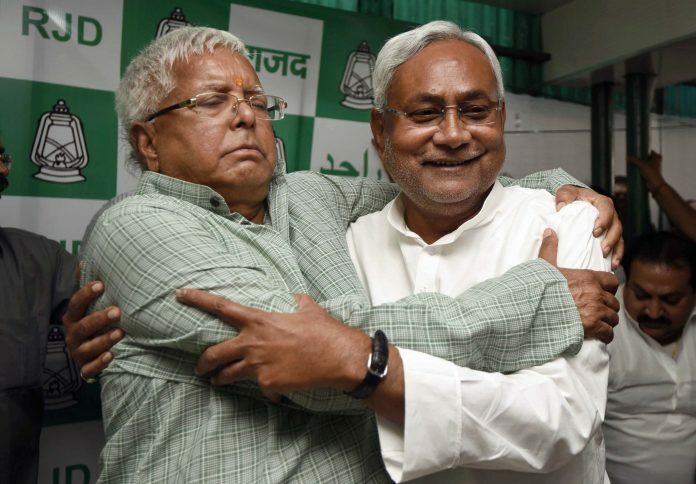 Just like the mahagatbandhan of the 2015 assembly election, a Lalu-Nitish alliance is beneficial to both. Tejashwi Yadav may keep saying the 2015 mandate was for the RJD because it got more seats, but the truth is that it won those seats partly on the back of Nitish Kumar’s face. Nitish Kumar is the trump card in Bihar. His popularity, particularly among the Extremely Backward Classes (EBCs), makes him necessary for the Yadav-dominated RJD or the upper caste-dominated BJP. Following the success of the RJD-JD(U)-Congress mahagatbandhan in Bihar, others were inspired too. In opposition parties, there is unanimity on the need to have only one opposition candidate against the BJP to even be in the race. The index of opposition unity has to be at its maximum. As a result, the Samajwadi Party (SP) and the Bahujan Samaj Party (BSP) have come together in an unlikely pre-poll alliance in Uttar Pradesh. Even if the SP-BSP alliance in UP causes a moderate dent to the BJP, Modi’s party could lose a significant number of seats. But UP won’t be enough. The damage in UP could at best reduce the BJP from a single-party majority to a coalition government. If the JD(U), the RJD and the Congress were to revert to their mahagatbandhan in Bihar, they could bring down the NDA to as low as 10 seats in Bihar, as opposed to the 31 it won in 2014. In other words, if Nitish Kumar and Lalu Yadav went back to being friends, they could damage the NDA by another 20 seats. This could be crucial in preventing the BJP from forming even a coalition government. If the opposition is serious about a joint, pan-India strategy in 2019, it cannot ignore Bihar. And if the BJP has to be stopped in Bihar, it can’t be done without Nitish Kumar on board. Previous articleUrgent question facing Rahul Gandhi: Whom to pick as Congress leader in Lok Sabha? In modern day Indian Politics anything can happen anytime ! New meanings and new definitions of politics very much in the offing ! Politics in India now knows no friends and no foes ! Politics is only a marriage of convenience and vested interests only ! It is now a game of hide and seek ! In Bihar neither Lalu Prasad Yadav nor Nitish Kumar have any qualms or morality left in them! Same is the case of Ram Bilas Paswan ! by hook or crook ! Hail opportunism ! Ideologies-Prinicples now seem to have been thrown to winds with impunity ! Only God now to save INDIA ! @Ashok Completely agree. That’s the way to go. Nitish kumar is competent enough to use Lalu and family instead of being used by them. As they say in Bollywood, ganda hai par dhandha hai … Between father and son, Laluji, having taken more than his share of knocks, would be inclined to play safe, take NK back. The young inheritor feels confident, but that can sometimes turn to overconfidence. Better to accept a chastened Nitishbabu back into the fold. With his aura diminished, the Yadavs will have the upper hand.